This article was first published on October 21 2013. Female Genital Mutilation (FGM), also known as female genital cutting or circumcision, is a practice that involves incisions or injury to the female genitalia or removal of external genital tissue for non-medical reasons. Recent research by the World Health Organisation has estimated that roughly 140 million girls and women worldwide are currently living with the consequences of FGM, with the large majority living in African countries. Data from a large-scale study published by UNICEF shows that in seven countries, almost all women and girls between the ages of 15 and 49 questioned stated that they had experienced some form of FGM. The national prevalence rates of Dijibouti (93.1%), Egypt (91.1%), Eritrea (88.7%), Guinea (95.6%), Mali (85.2%), Somalia (97.5%) and Northern Sudan (90%) demonstrate near universality of the practice in some parts of Africa. 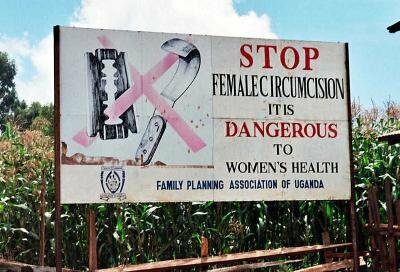 A campaign against female genital mutilation near Kapchorwa, Uganda (Amnon Shavit). Whilst its exact origins are largely unknown, the procedure is heavily embedded within well-established traditions and customs, intertwined with a complex terrain of social acceptance, marriageability, and initiation into adulthood. Mostly carried out on young girls sometime between infancy and 15 years of age, those at risk of FGM have minimal power to resist the practice, often pressured by their own family and elders, alongside members of their particular ethnic group. The medical language of FGM does not always do justice to the serious physical and psychological effects of the practice. FGM can lead to septicaemia, infection and infertility, extreme blood loss, sexual dysfunction, psychological trauma, and complications in pregnancy and childbirth, amongst a multitude of other complications. Fundamentally, the practice of FGM violates some of the most well respected human rights: the rights of the child, the rights of women, and the right to be free from torture. 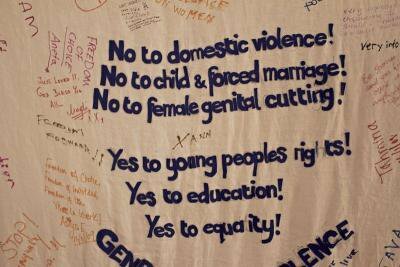 In December 2012, the UN General Assembly adopted a resolution to ban FGM worldwide. However, despite a number of international and domestic campaigns (28 Too Many, End FGM, Equality Now, Forward, Daughters of Eve amongst many) the practice is still frighteningly prevalent. The End FGM European Campaign (run by Amnesty International Ireland in partnership with a number of NGOs in countries with high prevalence of FGM) has estimated that three million girls and women are still subjected to the practice worldwide every year. That's 8,000 girls per day. So what is the UK doing to protect women and girls across the world from FGM? Since the 2003 introduction of the Female Genital Mutilation Act, FGM has been deemed a criminal offence, both in terms of FGM practiced on UK soil and FGM practiced overseas on UK nationals. Whilst earlier this year, Britain announced the biggest ever investment in eradicating the practice internationally, our commitment to protecting the rights of women and girls cannot be limited to international aid programs and development initiatives. We must also make sure that the UK is a place of safety for those seeking protection from FGM. This weekend, the BBC News channel re-aired Sue Lloyd Roberts' Newsnight report on FGM. Following the particular story of one Gambian woman seeking protection for herself and her young daughter from FGM in her country of origin, Lloyd Roberts investigated the Home Office's grounds to refuse refugee protection to this young mother. Whilst the Home Office claimed that this individual could be returned to another part of Gambia where FGM was not practiced (despite FGM being legal in Gambia) and where her family and previous community leaders could not locate her, Lloyd Roberts revealed that this option of 'internal relocation' was both unfeasible and unsafe. To return this individual to Gambia would be to facilitate the practice of FGM on this mother's young daughter. Unfortunately, this is not an isolated incident. The UK courts have stated that if a woman is a risk from FGM in one part of her country of origin and it would not be reasonable for her to live in another part of her country, the UK should allow her to live here as a refugee. Yet it has been reported that hundreds of women fleeing FGM have been refused asylum in the UK in recent years. The tendency to offer 'internal relocation' ignores the voices of many campaigners who have been keen to point out that FGM is practiced amongst specific ethnic groups rather than nationalities. When the practice of FGM straddles the borders of nations and administrative regions, as opposed to being limited by them, finding safety through internal relocation is often impossible. Speaking to the New Internationalist earlier this year, a Nigerian woman seeking safety from FGM for herself and her daughter explained her protracted battle with the UKBA to secure refugee protection. After witnessing her first daughter die at the hands of a botched FGM procedure, Abiola refused to allow her second daughter to face the same fate. After divorcing her husband and fleeing conservative relatives, Abiola requested help from the Nigerian police after her daughter was violently assaulted during a kidnapping attempt by her uncle. The threats to Abiola's daughter were dismissed as a 'family matter' by the authorities, leaving her no option but to seek safety abroad. However, once in the UK, her asylum claim was rejected; internal relocation was once again offered as an alternative to refugee protection. “While [gender] should not automatically qualify someone for asylum, case owners (and the Home Office in general) must improve the treatment of women who have suffered at the hands of members of their families or communities and not been able to access protection from the state. […] At a time when the criminal justice system is finally waking up to the needs of victims of domestic and sexual violence, the asylum system should be doing the same.”(Paragraph 51). Read alongside Articles 60 and 61 of The Istanbul Convention, the first European legally-binding instrument specifically devoted to violence against woman, it is time for the UK to commit itself to interpreting the 1951 Refugee Convention in a more gender-sensitive manner, to recognise persecution on the grounds of gender and not to expel anyone to a country where their life, rights or freedom is under threat. Women and girls who seek safety in the UK from FGM risk their lives to take a stand against the practice; their bodies are on the frontline. These are brave, strong women, exercising their right to choice and they deserve to be treated with respect. A strong campaign to 'drop the knife' worldwide can only succeed if we ensure that those seeking asylum on FGM grounds are provided with protection in the UK, rather than sent back for 'internal relocation.' This is the logic behind a petition which is calling for the UK government to ensure that those fleeing FGM are provided with refugee protection in the UK. If we fail to do this, we can only claim to be redistributing, rather than rectifying, the problem. If FGM is, in the words of the Home Secretary Theresa May, “an aborrhant form of child abuse which this government is committed to eradicating", let us not fall into the hypocrisy of denying protection to those who need it most.